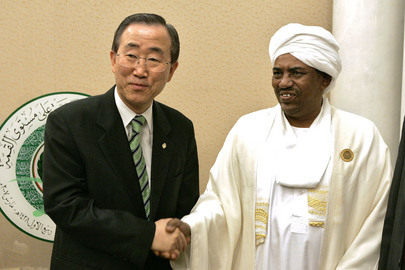 On Inaction in Abyei, Ban's UN Says It Was "Not Mandated" to Oppose Sudan Army: Rwanda Redux? UNITED NATIONS, December 20 -- Despite the UN's claims to have learned from its peacekeepers' shameful inaction in Rwanda and Srebenica, things have hit a new low at the UN of Secretary General Ban Ki-moon and his Department of Peacekeeping Operations, which he put under Herve Ladsous, the fourth Frenchman in a row in the position. Inner City Press on Tuesday asked Ban's spokesman Martin Nesirky about the UN's inaction in Abyei, both in light of an Amnesty International report that "peacekeepers from the UN Mission in the Sudan (UNMIS) were stationed in Abyei during the May violence but failed to take any 'meaningful action' and a previous, perhaps even more damning because internal UN Development Program report. "'Former UNMIS personnel told Amnesty International that a decision was made not to militarily engage with the Sudan Armed Forces (SAF) because SAF was better equipped,' Amnesty said. AFP* was unable to reach UN officials who could respond to the allegations." When Inner City Press asked Nesirky about this quote, that "a decision was made not to militarily engage with the Sudan Armed Forces because SAF was better equipped," Nesirky did not deny it. Rather, Nesirky twice said "that Mission was not mandated to oppose forces of the state." Video here, from Minute 14:52. The UN mission in Rwanda in 1994 was under Chapter 6 of the UN Charter, but UN peacekeepers' inaction is still said to be a source of shame to at least some UN officials. Inner City Press began to asked Nesirky, "Didn't UNMIS have a protection of civilians mandate" -- but Nesirky tried to turn to one of the handful of other questioners in the briefing room. Video here, from Minute 15:18. Inner City Press protested that it was a serious question, on which it had the same right to follow up as Nesirky had earlier granted questions about Camp Ashraf in Iraqand Deputy Secretary General Asha Rose Migiro's visit to sign the book of condolences for Kim Jong-Il at the mission of the Democratic People's Republic of Korea. Reiterating the unanswered query concerning the UN's and UNMIS' duty to try to protect civilians, Inner City Press explicitly asked about the UNDP report of May 22, 2010 stating that "The Force Commander [Major General Moses Bisong Obi] advised that they saw the SAF build-up and attack coming but they were unable to stop it. There had however been assurance by SAF that UN would not be targeted." Inner City Press asked, when did Obi know what the Sudanese Armed Forces were going to attack? Who provided the "assurances" to him? Video here, from Minute 15:49. Nesirky merely repeated that UNMIS "was not mandated to oppose forces of the state." Footnotes: In the quote above, that AFP (Agence France Presse) "was unable to reach UN officials who could respond to the allegations" seems strange, given that the UN Department of Peacekeeping Operations is being run by the fourth Frenchman in a row, Herve Ladsous. As noted, the French mission to the UN did not even know, the day of the announcement, that Ban was appointing Ladsous and not younger fellow Frenchman Jerome Bonnafont. When Inner City Press reported this, the French mission used a French media outlet -- AFP -- to harass Inner City Press for more than a month. Notwithstanding France's role during the Rwanda genocide (and Ladsous' defense of it while serving as France's Deputy Permanent Representative in the Security Council in 1994), what would France have to say to the position that UNMIS "was not mandated to oppose the forces of the Sudanese state"? Watch this site.